The PT timer is an adjustable precise time delay pneumatic device. The timer is available with an on delay (NC), or an off delay (NO) output. The timer has 1/8 inch NPT ports. The PT series timer combines a pneumatic timing mechanism with a floating spool valve assembly to provide a wide range of adjustable time control for fluid power systems. The timing assembly, which operates independently of the control pressure, is available in nine different ranges from one tenth of a second to 60 minutes, adjustable by means of a time-calibrated dial. 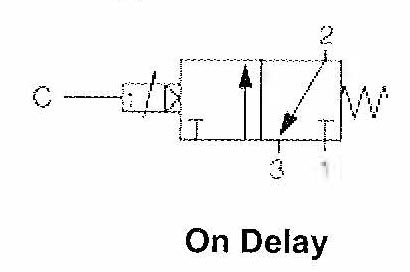 Timing action is initiated by a motor diaphragm operated by a control pressure of from 5 to 140 PSIG. The timer is equipped with a multi purpose 3 way output valve allowing it to be used as normally open, normally closed or as a diverter. The PT is designed for panel or surface mounting. Panel mounted versions include a 3 13/16 inch square bezel while surface mounted units are equipped with a bracket for vertical mounting. If required, The PT can be specially calibrated for mounting horizontally. On Delay Vertical Position Standard Vertical Surface Mount 0.1 to 1 sec. On Delay Vertical Position Standard Vertical Surface Mount 0.5 to 5 sec. On Delay Vertical Position Standard Vertical Surface Mount 1.5 to 15 sec. On Delay Vertical Position Standard Vertical Surface Mount 5 to 50 sec. On Delay Vertical Position Standard Vertical Surface Mount 20 to 200 sec. On Delay Vertical Position Standard Vertical Surface Mount 1 to 300 sec. On Delay Vertical Position Standard Vertical Surface Mount 1 to 10 min. On Delay Vertical Position Standard Vertical Surface Mount 3 to 30 min. On Delay Vertical Position Standard Vertical Surface Mount 6 to 60 min. On Delay Horizontal Position Standard Vertical Surface Mount 0.1 to 1 sec. On Delay Horizontal Position Standard Vertical Surface Mount 0.5 to 5 sec. On Delay Horizontal Position Standard Vertical Surface Mount 1.5 to 15 sec. On Delay Horizontal Position Standard Vertical Surface Mount 5 to 50 sec. On Delay Horizontal Position Standard Vertical Surface Mount 20 to 200 sec. On Delay Horizontal Position Standard Vertical Surface Mount 1 to 300 sec. On Delay Horizontal Position Standard Vertical Surface Mount 1 to 10 min. On Delay Horizontal Position Standard Vertical Surface Mount 3 to 30 min. On Delay Horizontal Position Standard Vertical Surface Mount 6 to 60 min. Off Delay Vertical Position Standard Vertical Surface Mount 0.1 to 1 sec. Off Delay Vertical Position Standard Vertical Surface Mount 0.5 to 5 sec. Off Delay Vertical Position Standard Vertical Surface Mount 1.5 to 15 sec. Off Delay Vertical Position Standard Vertical Surface Mount 5 to 50 sec. Off Delay Vertical Position Standard Vertical Surface Mount 20 to 200 sec. Off Delay Vertical Position Standard Vertical Surface Mount 1 to 300 sec. Off Delay Vertical Position Standard Vertical Surface Mount 1 to 10 min. Off Delay Vertical Position Standard Vertical Surface Mount 3 to 30 min. Off Delay Vertical Position Standard Vertical Surface Mount 6 to 60 min. Off Delay Horizontal Position Standard Vertical Surface Mount 0.1 to 1 sec. Off Delay Horizontal Position Standard Vertical Surface Mount 0.5 to 5 sec. Off Delay Horizontal Position Standard Vertical Surface Mount 1.5 to 15 sec. Off Delay Horizontal Position Standard Vertical Surface Mount 5 to 50 sec. Off Delay Horizontal Position Standard Vertical Surface Mount 20 to 200 sec. Off Delay Horizontal Position Standard Vertical Surface Mount 1 to 300 sec. Off Delay Horizontal Position Standard Vertical Surface Mount 1 to 10 min. Off Delay Horizontal Position Standard Vertical Surface Mount 3 to 30 min. Off Delay Horizontal Position Standard Vertical Surface Mount 6 to 60 min. On Delay Vertical Position Panel Mounted 0.1 to 1 sec. On Delay Vertical Position Panel Mounted 0.5 to 5 sec. On Delay Vertical Position Panel Mounted 1.5 to 15 sec. On Delay Vertical Position Panel Mounted 5 to 50 sec. On Delay Vertical Position Panel Mounted 20 to 200 sec. On Delay Vertical Position Panel Mounted 1 to 300 sec. On Delay Vertical Position Panel Mounted 1 to 10 min. On Delay Vertical Position Panel Mounted 3 to 30 min. On Delay Vertical Position Panel Mounted 6 to 60 min. 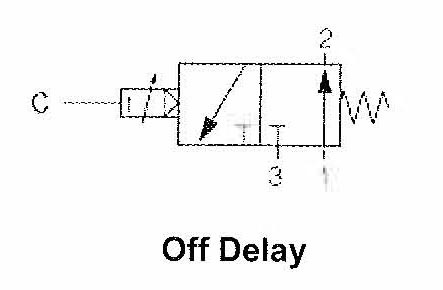 On Delay Horizontal Position Panel Mounted 0.1 to 1 sec. On Delay Horizontal Position Panel Mounted 0.5 to 5 sec. On Delay Horizontal Position Panel Mounted 1.5 to 15 sec. On Delay Horizontal Position Panel Mounted 5 to 50 sec. On Delay Horizontal Position Panel Mounted 20 to 200 sec. On Delay Horizontal Position Panel Mounted 1 to 300 sec. On Delay Horizontal Position Panel Mounted 1 to 10 min. On Delay Horizontal Position Panel Mounted 3 to 30 min. On Delay Horizontal Position Panel Mounted 6 to 60 min. Off Delay Vertical Position Panel Mounted 0.1 to 1 sec. Off Delay Vertical Position Panel Mounted 0.5 to 5 sec. Off Delay Vertical Position Panel Mounted 1.5 to 15 sec. Off Delay Vertical Position Panel Mounted 5 to 50 sec. Off Delay Vertical Position Panel Mounted 20 to 200 sec. Off Delay Vertical Position Panel Mounted 1 to 300 sec.